Hello turtle friends from Susan and Marshall at American Tortoise Rescue. Our house and the turtle hospital in Malibu burned down Friday, November 10, during one of California’s most devastating wild fires. With last minute evacuation orders, we loaded both cars with animals, including all of the undersized and ill, as well as our seven special needs box turtles from the turtle hospital. We left our possessions behind. Bunkle, our mascot, also rode out with us. The rest sheltered in place in fireproof housing as planned. The fire descended on the rescue taking out fencing, trash cans, plants, trees, anything it could attack. Thankfully, Tank, Poppy, Evil, Fluffy and more than 90 % of all the turtles and tortoises survived, including two rescued roosters. They were shell shocked as you can imagine from the sights and sounds they experienced as the fire raged through and the winds blew at more than 50 mph. But they survived the meteor that destroyed the dinosaurs, so we know they will survive and thrive. Replacing the turtle hospital and all of its contents will be a major expense, as will the renovation and upgrade of the entire sanctuary that took such a beating when the fire storm went through. Thank you so much for being here for us by donating to GoFundMe. Please share widely with all your turtle loving friends. 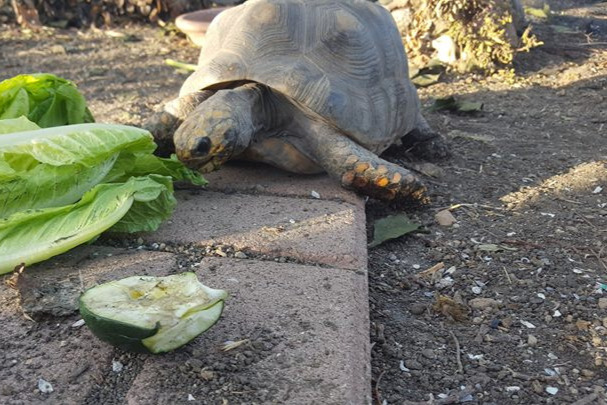 And follow us on Facebook at American Tortoise Rescue, as we will have frequent updates.